The London Underground is a system of electric trains that are in London, England. It is the oldest underground railway in the world. It started running in 1863 as the Metropolitan Railway. After the opening the system was copied in many other cities, for example New York and Madrid. Even though it is called the Underground about half of it is above the ground. The "Tube" is a slang name for the London Underground, because the tunnels for some of the lines are round tubes running through the ground. The Underground has got 274 stations and over 408 km of track. From 2006–2007 over 1 billion passengers used the underground. Underground train systems in other cities may be called metros (like the Tyne and Wear Metro in North East England) or subways (Glasgow Subway in Scotland and in most of North America). Subway is also used across Britain to refer to underground walkways. The nickname "the Tube" comes from the round tunnels some trains use. The 'tube train' shown is in a tunnel near Hendon Central Station, London. The Metropolitan Line was the first part of the Underground to be made. It was opened in 1863. It then ran between Paddington and Farringdon. It took 40,000 passengers per day. Later it was made longer. The District Line was built by a different company. In 1884, the Circle Line was finished. All these lines used steam engines at first. In 1890, a line using electric trains was opened. It was much deeper below ground than the other lines. Now it is part of the Northern Line. More lines like this were opened. People liked them, so in 1905 the lines that used steam engines were changed to use electric trains. Because the different lines were run by different companies, changing lines was difficult. Between 1900 and 1902 Charles Yerkes bought most of the companies and formed a company named Underground Electric Railways of London Company Ltd, short UERL. In 1933 a company was formed of all the bus, tram and underground companies, called London Passenger Transport Board (LPTB). It planned to make the network longer, but the Second World War stopped this. In the war, some Underground stations were used as shelters against bombs. After the war more passengers used the underground. Minor changes were made: Victoria Line was opened in the 1960s, and currently the Piccadilly Line was extended to Heathrow Airport in 1977. The Jubilee Line was opened in 1979, and extended to Stratford 20 years later. Night Tube was introduced in 2016. The system uses two kinds of trains, a big type - called sub surface trains and a smaller type - deep level trains. 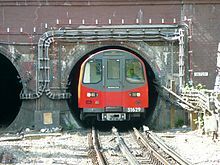 The big ones are used for the rectangular tunnels (District Line, Metropolitan Line, Circle Line), the small ones for the round tunnels. Most lines have different trains, although they fit into one of the two categories. The Underground's trains usually drive to 270 stations. 14 Stations are outside of London. The Underground uses zones to collect fares. There are 9 zones. Zone 1 is the most central zone. The only London Underground stations in Zones 7 to 9 are on the Metropolitan line beyond Moor Park, outside Greater London. Some stations are in two zones, and the cheapest fare applies. Paper tickets or the contactless Oyster card can be used for travel. The Oyster Card is a plastic card which stores credit (money and Travelcards) which the owner uses to pay for Underground travel. The user must "charge" (put money onto) their card at a ticket machine. They then touch the card on a yellow reader to pay for their journey. Since its introduction in 2002 it has become very popular with regular travelers, as the prices are much cheaper if you use an Oyster card. There are ticket offices, some open only in the rush-hour, and ticket machines, which can be used at any time. Some machines take coins only, other touch-screen machines take coins and English notes, and usually give change. These machines also take credit and debit cards: some newer machines accept cards only. When most of the stations in the London Underground system were built, disabled and wheelchair access was not considered. While many above-ground stations have only a few steps to the platform, nearly all Underground stations have some of the systems's 410 escalators and 112 lifts (elevators). Newer stations include disabled access, and many older stations install disabled access when they are refurbished or rebuilt. Since 2004, maps inside the trains show which stations have step-free access from street level. Transport for London plan to have a network of over 100 fully accessible stations by 2020, which means that 75% of Tube journeys can be made with step-free access. The escalators in the London Underground system are some of the longest in Europe. They run 20 hours a day, 364 days a year and are used by 13,000 people per hour, with 95% of them running at one time. Platform Screen Doors at Westminster Station. There have been relatively few accidents in the Underground's history. Most happen if people accidentally fall onto the tracks. In some stations there are pits in the middle of the track to stop people being injured if they fall onto the track. Newly rebuilt parts of the system, especially on the Jubilee line, have platform doors. These doors only open when a train stops and prevent people falling or jumping onto the tracks. In recent years, refurbished and rebuilt parts of the Underground, especially the Jubilee Line (around Westminster) have had sliding platform doors installed to prevent people falling off the platform onto the tracks, and discourage/prevent suicides. In the 30s, 70s and 90s the Underground was bombed many times by the IRA, and for this reason there have been no wastebins in or around stations until very recently, when clear plastic sacks were introduced in some parts of the system. On 7th July 2005 there were three attacks by radical Islamic terrorists on two Circle Line trains and on one Piccadilly Line. Smoking is not allowed in any part of the underground. It was banned after a fire in King's Cross Station in 1987. The commuters of London often complain about the Underground. Even newspapers, especially the Evening Standard, often criticise the system. Usually the complaints are about delays, overcrowding and the fares. Sometimes strikes of London Underground staff occur. London Underground fares are now the most expensive of any rail system around the world, including the luxurious Orient Express, and they continue to rise at very high levels. Concern has also been raised over the huge difference between oyster card fares and cash fares, with the criticism that the high cash fares will discourage tourists and day visitors to London from traveling around the City. Because the underground is a very old system, engineering work is often needed and often causes delays. There can be other reasons as well, for example signal failures or other breakdowns. Customers can claim a refund if their tube journey is delayed for more than 15 minutes due to problems within the control of Transport For London. Because many more commuters use the underground than planned, overcrowding often happens. This can cause stress and frustration with the underground system among commuters. According to a report by MPs, commuters face "a daily trauma" and are often forced to travel in "intolerable conditions". Because so many passengers travel on the London Underground network every day, strikes or industrial actions on the Underground network have a very high impact on London's traffic and can impact on London's economy. London Underground and the rail unions claim to be under high pressure from the working public, private businesses and government departments. Strike actions on the London Underground occur for a number of reasons, including health and safety, working conditions and pay levels. There were several such strikes in the late 1970s. ↑ 3.0 3.1 Day & Reed 2010, p. 122. ↑ Horne 2006, pp. 13, 24. ↑ Ovenden 2013, p. 220. ↑ "London Rail & Tube Services Map" (PDF). Transport for London. December 2012. Retrieved 30 March 2013.